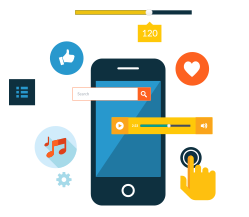 We strategise, concept, design, develop, test, market and maintain the highest quality mobile apps in Australia for iOS, Android and Windows platforms. Sometimes, a website can be a more ideal solution for your needs than an app. Our focus is on making stunning, future-proof responsive websites that work across all devices. We meticulously develop adaptable, responsive websites that are customized for each client’s specific needs.